The OHP 5000 is the easiest to use, simplest to understand, most complete on-hold audio system ever made...period...the end. Digital player -- Just drop in a single-track CD, close the lid -- the OHP 5000 spins up the disc and records it into digital flash memory...playback begins immediately. Want to record tracks individually? You can do that, too. 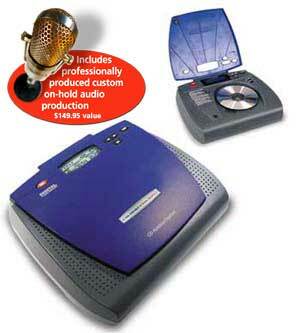 The OHP 5000 comes with an 8-minute recording capacity. Want more time? Simply lift a door to add memory modules and upgrade to 16, 24 or 32 minutes. FREE Custom production -- We've even got that handled! Every OHP 5000 ships with a certificate for a free, studio-produced, multi-message, custom on-hold production read by professional voice talent and mixed with choice of music background. The final production is put on a CD and sent to the user. All they have to do is drop it into the player and walk away. Getting a high-quality on-hold audio production has never been easier or more affordable. It used to be that only businesses with PBX or KEY phone systems could have on-hold audio...not anymore! The OHP 5000 has an optional Analog Adapter Module that plugs into the unit internally. The module is a landmark achievement that allows millions of businesses, without PBX or KEY systems, to have on-hold audio for the first time, ever. The module works with virtually all analog and KSU-less phones and is activated by pressing the hold button on any phone extension. The module supports up to four incoming lines and provides on-hold audio on up to 50 phone extensions. With the OHP 5000 and the optional analog adapter module, any business, regardless of size, can sound like a corporate giant. Cash in on a new market made up of millions of home-based and small business with this revolutionary new product!